The Art of Flintknapping involves the production of many types of stone tools above and beyond projectile points and other flaked tools. Dr. "Arizona" Gleason, in her exploration of this ancient craft, has thus attempted to master the production of other usable tools. These items are replications of actual groundstone (stones used to grind material) artifacts and other tools made by grinding or pecking. Such tools are great for use in the classroom or museum, or even for actual practical use. A large amount of time and effort goes into their traditional manufacture. Remember when you order one of these artifacts that it will take at least two months to make before shipping. The ones shown here are generic in nature, for those replicating tools specific to a region or era visit the Specific Tool Replicas page. Please CONTACT US or use this Special Request Form (pdf) to obtain a quote for the replication of any other stone tools you might be interested in. These highly shaped tools are hand pecked from a matched type of igneous rock. They are also sized to fit and work with each other. These mortars began as a large naturally rounded igneous rock that has been hand pecked to a smooth rounded exterior with a deep broad hole in the top. The high price is a reflection of the amount of time and effort put into the traditional manufacture process of pecking. These average about one foot to one foot and a half in diameter and height and about one hundred and fifty pounds in weight. The hole is about eight to ten inches deep and six to eight inches wide. Please be aware that there is quite a degree of variety in finished dimensions and appearance. If you have any specific requests, please note them in the comment section of the shopping cart. These highly shaped cylindrical tools are hand pecked from igneous rock. They are sized to fit the available Large Mortars, being about a foot long. Please be aware that there is quite a degree of variety in finished dimensions and appearance. If you have any specific requests, please note them in the comment section of the shopping cart. These mortars began as a medium sized naturally rounded igneous rock that has been hand pecked to a smooth rounded exterior with a deep broad hole in the top. The high price is a reflection of the amount of time and effort put into the traditional manufacture process of pecking. These average about ten to twelve inches in diameter and height and about one hundred pounds in weight. The hole is about six to eight inches deep and five to six inches wide. Please be aware that there is quite a degree of variety in finished dimensions and appearance. If you have any specific requests, please note them in the comment section of the shopping cart. These highly shaped cylindrical tools are hand pecked from igneous rock. They are sized to fit the available Large Mortars, being about a ten inches long. Please be aware that there is quite a degree of variety in finished dimensions and appearance. If you have any specific requests, please note them in the comment section of the shopping cart. These highly shaped tools are hand pecked from a matched type of igneous rock. They are also sized to fit and work with each other. This set has the specifically wide bowl of the Bowl Mortar option. These mortars began as a large naturally rounded igneous rock that has been hand pecked to a smooth rounded exterior with a very broad "bowl" in the top. The high price is a reflection of the amount of time and effort put into the traditional manufacture process of pecking. This mortar variety in particular involves a enormous amount of labor and will probably involve several false starts (broken pieces). These average about one foot in diameter and height and about one hundred pounds in weight. The bowl is about eight inches deep and ten inches wide. Please be aware that there is quite a degree of variety in finished dimensions and appearance. If you have any specific requests, please note them in the comment section of the shopping cart. 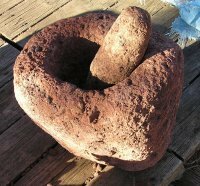 The Herb Mortar and Pestle are the smaller, more economical, and easier to transport version of these highly shaped tools which are partially hand pecked from a matched type of rock. This artifact was often used to crush herbs, smaller items, and paint pigments (hence the name). They are sized to fit each other. The mortar averages under a 1/2 foot in width. Please be aware that there is quite a degree of variety in finished dimensions and appearance. If you have any specific requests, please note them in the comment section of the shopping cart. The Mexican Mortar and Pestle offered here is an imported variety rather than made by Dr. "Arizona." They have a very shallow bowl, three legs, and a stubby form of pestle. Often these are simply used for making salsa. The Mortar Maintenance Kit was developed due to numerous questions about mortar use by customers. It includes a quartzite hammerstone that has been prepped for use in mortar surface maintenance. This kit also includes a reproducible sheet of information about mortar preparation, use, and maintenance. These Metates, otherwise known as Grinding Slabs, are hand pecked slabs which can be any of a wide variety of rock types. They are full size, averaging just under two feet in length. The trough is open ended unless otherwise requested. Seeds are ground in a forward and back motion on these slabs. There are three basic varieties offered here with different material selections. Please be aware that there is quite a degree of variety in finished dimensions and appearance. If you have any specific requests, please note them in the comment section of the shopping cart. These smaller tools are hand pecked from a wide variety of rock types. They are roughly rectangular to rounded in shape with two flattened sides. The Rough Mano is simply a modified water-worn cobble. These specific Manos are sized to fit the available Metates. These highly shaped tools are hand pecked from traditional materials and are also sized to fit each other. Like the metate options, you can select between three varieties and basic material types. 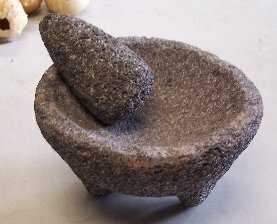 These metate/mano combinations can easily weigh one hundred pounds or more and are thus not made to be portable. Please be aware that there is quite a degree of variety in finished dimensions and appearance. If you have any specific requests, please note them in the comment section of the shopping cart. Each of these comes with a Metate Maintenance Kit. These highly shaped and highly portable tools are hand pecked from traditional materials and are also sized to fit each other. 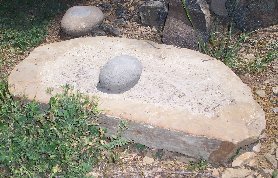 The metate averages under 1 foot in length, 8 inches wide, and 3 inches thick. This option, unlike the other options, only has a slight surface depression rather than a trough. 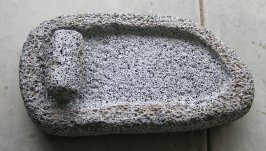 This metate and mano combination is great for classroom use. Any special requests can be noted in the comment section when ordering. This ground stone variety is a metate that is rounded rather than rectangular. Like the other varieties it is highly shaped and hand pecked from traditional materials that are sized to fit each other. 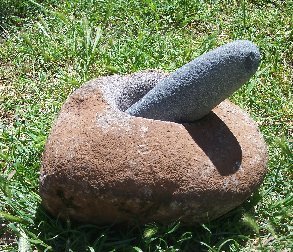 Seeds are ground in a circular motion in a wide shallow bowl on the metate surface. The metate averages about 1 foot in diameter and varies considerably in thickness. Any special requests can be noted in the comment section when ordering. 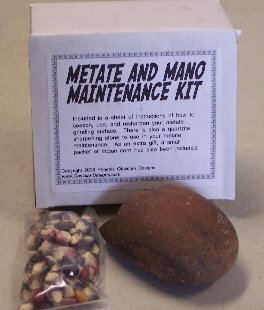 The Metate Maintenance Kit was developed due to numerous questions about metate use by customers. It includes a quartzite hammerstone that has been prepped for use in grinding surface maintenance. This kit also includes a reproducible sheet of information about metate preparation, use, and maintenance. This flat stone was used for milling pine nuts and other small seeds. It has a flat surface and a very thin width. Less than 1 foot in length, 8 inches in width, and 2 inches in thickness. This tool was specifically designed to be portable. The working surface is roughened but not depressed. The stone is either sandstone, schist, or other lightweight stone. Any special requests can be noted in the comment section when ordering. This stone was used for cracking nuts or acorns. 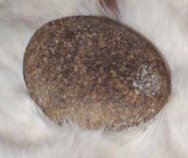 A similar stone could be used for doing bipolar percussion work. 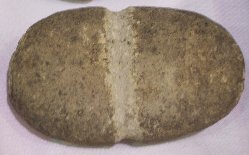 It is an oval shaped cobble with a slight depression at one end where the hammerstone would contact the nut or other material being broken. The cobble is a hard rock such as quartzite or diorite. Any special requests can be noted in the comment section when ordering. This stone was used for cracking nuts or acorns. 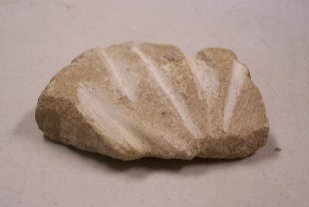 A similar stone could be used for doing bipolar percussion work. It is a thick rock of a wide variety of dimensions but possessing a flat top surface. This surface has a slight depression to keep the item to be cracked or broken from moving around. The rock material is of a harder variety of stone such as granite or diorite. Any special requests can be noted in the comment section when ordering. 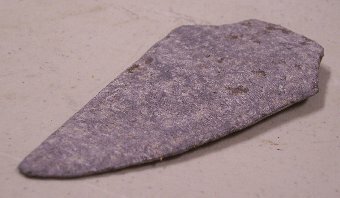 A relatively thin flat stone with a pecked shallowdepression at the center of one side. A bottomless basket was attached by some adhesive, like asphaltum, around this depression so that it provides the solid base to this portable mortar. This replication comes minus the basket. 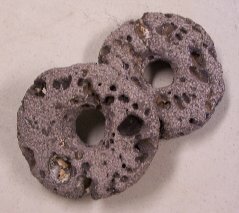 This abrasive stone was used for the sharpening of bone or antler points. It is either sandstone, scoria, or some other particularly rough textured stone. The piece offered here is about five inches in at least one dimension. Any special requests can be noted in the comment section when ordering. A rectangular sandstone or scoria two-part tool with an internal groove into which the arrowshaft is placed. The two parts are then held closed as the arrowshaft is moved in a back-n-forth twisting motion in order to sand it smooth. 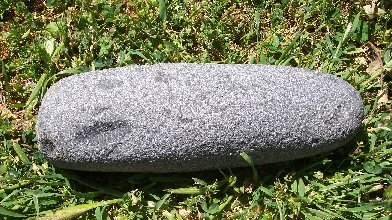 A rounded oval soapstone tool with one or two external grooves on one side. The tool is placed in the fire to get it hot, then tongs are used to remove the straightner. The arrowshaft is placed in the gooves after the shaft is either wetted or greased. Pressure is placed on the shaft to either side of the tool - attempting to slowly straighten out a bend in the shaft by applying pressure opposite the bend. This artifact is a basically axe shaped piece of CCS or other hard stone. It is first percussion knapped into a rough shape and then laboriously ground into its final smoothed form. It has a pecked depression around the thicker end for placement into a handle. Based after a traditional type of axe head found in Arizona and California as well as many other regions. 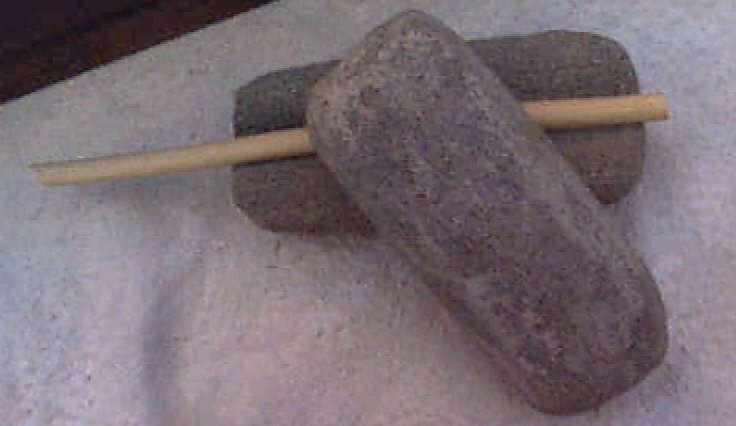 A rough stone with a rounded hammer end and a pecked depression for hafting. 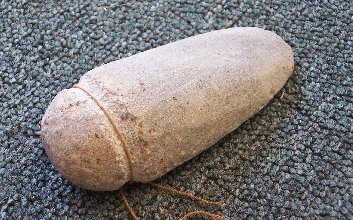 A hammerstone is an item used to shapen a stone tool. Offered here are ones that have been used to create the other tools being sold here. The first type was used in the soft percussion reduction of the flaked materials. The usage patterns are visible by the faceting of the surface area. The other are Quartzite hammerstones that were used to shape groundstone tools. One side of the original quarzite cobble was broken off to create a beveled working edge. As the tool was used, more flakes were broken off this edge to resharpen it. These artifacts are pecked and smoothed spherical stone objects that could have been used as bola ammunition. The beads offered here only come in two varieties. The first is a simple soapstone bead labouriously handcrafted by grinding and drilling. The second is a cruciform shaped polished stone that has no central hole but could have been attatched by lashing. These are made out of a variety of soft stones. Stone Rings have been found in many archaeological contexts. One interpretation of their use is as digging stick weights. Many have been found in burials. This replica is approximately four to five inches in diameter. They are made out of a wide variety of materials. 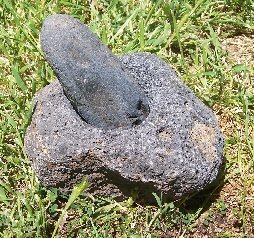 A shaped rock that is either perforated by a hole or has a surface depression girding the rock. The pecked girding depression is lengthwise on the fishing weights and widthwise on the ground net weights. The perforated version is a smaller version of the stone ring. These items are carved out of soapstone (steatite). This is a very soft rock that has been used through out human history to make artifacts. The lamp is a replica of one of the many archaeologically found lamp forms that have been used as a repository of animal fat in which a wick is placed. The Atlatl Weight is a rectangular smoothed piece with a central depression for attatching to the atlatl. The Platter is a relatively large flat piece of soapstone with a slight depressed surface area for holding items. The soapstone bowl replica is available here in the choice of three sizes: small (2" dia), medium (3" dia), large (5" dia). 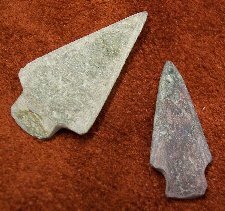 Knife blades and projectile points were also manufactured by the process of grinding lithic materials such as slate. The production of such tools was much more time intensive but the resulting edge was often much more durable than the flakeable materials.